After the very happy and promising week of bulls having their saying throughout the cryptocurrency market, it is no surprise that traders are taking advantage of the gains and gathering their profit. A red wave of decrease has overtaken the crypto-verse per time of writing for almost all leading coins, especially those in the top-ten by market capitalization. However, there are some that are standing above waters fearless like 0x (ZRX). 0x is a protocol that promotes low friction peer-to-peer exchange of ERC20 tokens on the Ethereum blockchain. The protocol is designed to serve as an open standard and basic building block, running interoperability among decentralized applications (DApps) that include exchange functionality. An Ethereum Smart contract system, which is free to apply, publicly available and any Decentralized Application can be attached to it, supports are runs the show for traders. – Former Chief Operating Office or COO of Paypal: David Sacks, has joined the advisory table of the now-famous 0x platform according to Fortune’s post. The positioning came as a result of the project’s partnership with Harbor which is backed by the above-mentioned. – One of the popular and constantly growing exchanges Kucoin have announced the listing of the coin which will undoubtedly assist digital entrepreneurs globally: 0x Protocol ZRX. – Circle the crypto-related investing platform supported by Goldman Sachs, announced that it will add four digital assets, which gained traction over the course of the past year. The startup’s head of product and SVP, Divya Agarwalla, explained that EOS (EOS), Stellar (XLM), 0x (ZRX) and QTUM (QTUM) will be added to Circle’s Invest platform over the next few days and weeks. 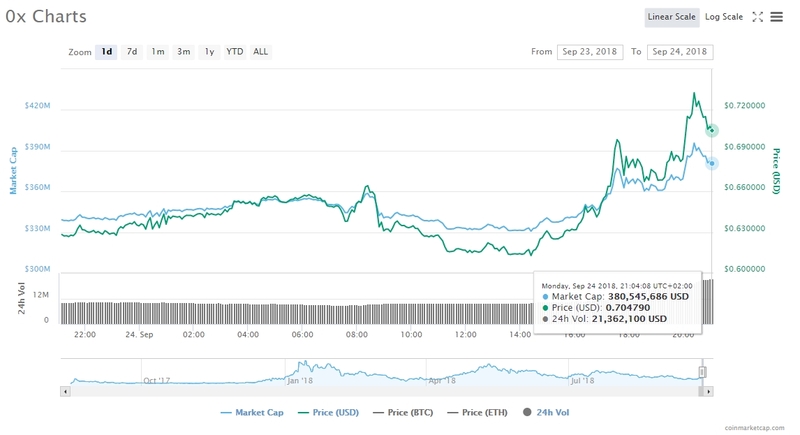 Per time of writing, the pair ZRX/USD is changing hands at $0.7105 with 13.01% gain in the last 24-hours reaching a total market capitalization of $383 million. Alongside Bytecoin and Zcash it is one of the only in the green for the last day. Even among top contenders.